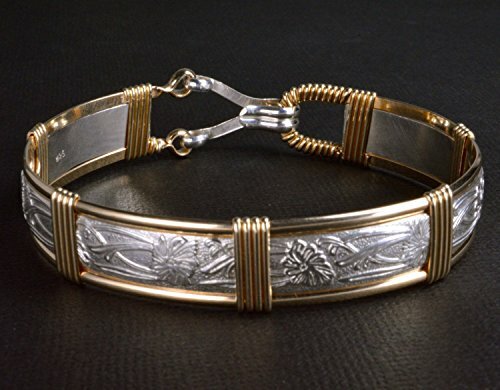 This scrolling iris flower patterned 925 sterling silver and 14k gold filled wire wrapped bracelet is absolutely stunning! My bracelets are made to be comfortable, beautiful and durable for a lifetime of enjoyment. This bracelet has an inner diameter of & inches making it medium size. All jewelry items include premium quality Made In Alaska gift packaging. Satisfaction guaranteed! If you have any questions about this product by Eclipse Designs Artisan Jewelry From Sitka, Alaska, contact us by completing and submitting the form below. If you are looking for a specif part number, please include it with your message.